Bank of Ireland raises €350m by buying back capital securities – meaning there is no need to write down its junior bonds. THE FINANCE MINISTER Michael Noonan has withdrawn his plans to burn the junior bondholders at Bank of Ireland, after the bank this morning announced it had reached its stress test targets for recapitalisation. 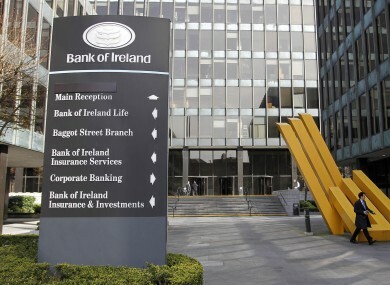 The bank this morning said it had purchased bought back around €1.1 billion in mortgage-backed securities, paying between 33 and 92 per cent of the face value for each of those notes. The exercise raised €350 million in ‘tier 1′ capital for the bank – meaning it has now reached the €4.2 billion target in new capital it had to raise under the last round of stress tests undertaken in March. The bank has raised the entirety of that amount of new capital through various means, including State aid, private capital and burden-sharing exercises – ensuring that it remains the only native Irish bank outside of full government ownership. In a statement, Noonan welcomed the bank’s progress – and announced that he would no longer be pursuing plans, announced last week, to write down the value of some of the bank’s junior bonds. Though the previous and current government had passed legislation allowing it to seek court orders which would write down the outstanding bonds, Noonan said he was no longer considering using those powers. Email “Noonan scraps BoI bond-burning plan after bank reaches stress test target”. Feedback on “Noonan scraps BoI bond-burning plan after bank reaches stress test target”.